Vim already falls in the scope of at leat SuperUser & StackOverflow; who do we need a separate StackExcange site? There are at least 3 different places with a significant number of Vim/Vi related questions, and 3 sites with some questions. There are probably some other sites with Vim/Vi related questions as well. This the same reason why an Emacs, TeX, or Ubuntu SE exists, all 3 SE sites fall within on the border between StackOverflow & SuperUser, and questions are scattered over those 2 (and some more) sites. Having a single resource would be an added advantage. I'd say that the strongest argument we have in favor of a separate Vim site is that Vim Q&A is already quite fragmented across the entire network. First of all, almost any question at all about Vim can fit on either Stack Overflow or Super User. Indeed, I've searched for Vim questions on SO before only to finally find an answer on SU. This is a Bad Thing™. Furthermore, fragmentation means you're not reaching your full potential audience. What if I have a question about Vim-LaTeX on Ubuntu? I only eventually decided to post on Ask Ubuntu because it got more traffic. This is also a very Bad Thing™. The people over on Tex - LaTeX don't get to see my question, so it gets less of a (specialized) audience. People from TeX - LaTeX might have the same problem, but give up because they can't find it on that site. Less questions + less answers = less happy unicorns. Also, it's not as if I'm the first to bring this up. But yeah, any argument you can make against Vim hurts your Emacs site, and anything good you say about those Emacs people over there applies equally to us too. I think the best site for Vi/Vim questions is Stack Overflow. If you are already interested in asking and answering questions about this family of editor, you really owe it to yourself to follow that filter for a few days. I just can't help comparing these actual questions to the example questions on this proposal. Area 51 example questions rarely make good questions on beta sites, but many of the examples here seem perfectly topical on Stack Overflow. To tackle the elephant in the room: Emacs set the precedent for splitting off programers' editors from Stack Overflow. Before the private beta, I proposed some criteria for spinning off topics. A topic split can only be successful if the new site reaches a new audience; cannibalizing an existing site is both inefficient and detrimental to people seeking answers. TeX/LaTeX was a good candidate because so many TeX users (mathematicians) do not consider themselves programmers. The same can be said for the various CMS sites. 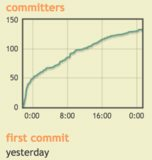 After 122 days in beta, we have enough data to see if the Emacs spinoff was successful. Before the private beta, there were ~7 Emacs questions per day across the network. As of today, the rate is ~5 q/day with the emacs tag. However, Emacs.SE is getting nearly 12 per day. Something like 40% of those questions (by my estimation) would be off-topic on any other site on the network. A reasonable guess is that splitting off the topic added somewhere between 3 to 10 Emacs questions a day to the network. Questions in the [vim] tag are answered as quickly, more often, and better than the typical tag. Plus those answers are viewed by more people. The data strongly suggests that Vi/Vim askers get the answers they need on SO. I'd be shocked if Vi.SE could improve on that. The first couple of pages of committers by reputation shows these are folks who are very comfortable with our network, but still want a [dedicated site]. These are people who are voting with their feet. It seems very likely that our existing sites are not meeting their particular needs. I still think this proposal is a waste of time and effort. Maybe I'm close-minded and biased, but I don't suspect that a site for Vi will draw a different audience than the one we already have on Stack Overflow. There will no doubt be plenty of questions in the private beta, but I'm going to be looking for questions that can't be asked on other sites. If Vi.SE succeeds, it will be by addressing questions that have nothing to do with programming. There was a large (now deleted) discussion of this on the old Vi(m) proposal. The closing of the proposal resulted in the most downvoted announcement on Area 51 (this announcement has also been deleted), with many answers arguing against the closing. Still, the motivation for closing a fully committed proposal remains a mystery for me, but I would like to quote the reasoning from this answer, which discusses why the Coffee proposal might be granted a site of its own, although there is already "Seasoned Advice" for "Food & Cooking experts"
A network (or group of sites) isn't always worth exactly the sum of its parts. If there is an audience out there we are failing to attract by lumping all these subjects under one umbrella (a culinary site), then splitting that subject off into a site of its own may actually result in a net gain overall. But if we're simply splitting apart one site to create two — for, essentially, the same audience — then that would be a poor allocation of subject space and completely undesirable… and we would take appropriate action. But the only way to know for sure is to give the site a try. And so far the subject of "Coffee" has passed the first trials of Area 51: gauging interest. Did Joel Spolsky just renounce “merging season”? If this site was launched, would Vim/Vi questions be migrated from SO? Does this proposal have significant overlap with IT Security? Why does BASIC need a devoted site? Would this site be for programmers using Vim or also general usage? Why there is no separate website for questions regarding Windows?